Webby Wednesday: Unrepeatables with Giveaway! | House Unseen. Life Unscripted. 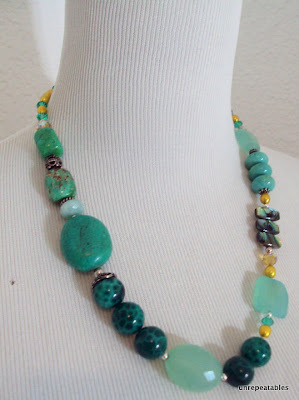 Welcome to the second installment of dweej's Webby Wednesday, this time featuring the fabulous jewelry at Unrepeatables and your chance to WIN!!!! a ring of your very own. Because Erin, the maven of Unrepeatables, is super awesome and wants to spread her fabulosity all over the world. But I'm getting ahead of myself again. 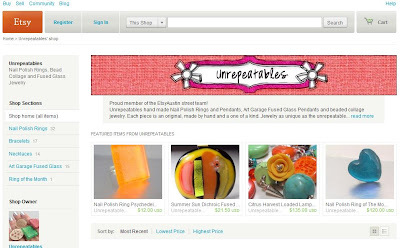 Proud member of the EtsyAustin street team! Unrepeatables hand made Nail Polish Rings and Pendants, Art Garage Fused Glass Pendants and beaded collage jewelry. Each piece is an original, made by hand and a one of a kind. Jewelry as unique as the unrepeatable women who inspire it! Ooooh, sounds awesome, right? Well, you know why it sounds awesome? Because it is! Are you just dying from fantasticness overload right now? I know, me too. This is the May ring of the month, which you could WIN! She is so smart. Once you join the club (or "da club" if you went to high school in east Dallas like I did), every month you will open your mailbox and, like magic, there will be a gorgeous, sparkly treat just waiting for you. A surprise. A pat-yourself-on-the-back for making it another 30 days without letting the air out of that loud neighbor's tires. Not that you I would ever do such a thing, of course. It's like you're paying happiness forward...to yourself. Or someone you love. Take your pick, baby. Either way, it's awesome! Which brings us to the part where you can WIN!!!! one of her fab rings. See that last picture up there with the square rings? That is the ring you could win, which will look slightly different in person because (according to Erin) her camera is totally enamored of the sparkles and sometimes decides to overemphasize them. For fun. Naughty camera. So it will look like that, but even better. Plus, it's free, so really? Can you really get picky? I didn't think so. All you have to do in order to enter is to go to her facebook fan page and click that cute LIKE button. Then you hop back over here and leave me a comment here that you did it and voila! You'll be in the running for your own snazzy Unrepeatables ring*. From all the entries, I'll be randomly selecting one winner, but entries must be received by 11:59 p.m. EST on Tuesday, May 17th to be considered. Blah, blah, blah...rule-ful talk is boring. There are no other ways to get entries because I'm too lazy to think of anything else I know you're busy and don't need the pressure of me telling you to do things. But feel free to tweet and share with your friends BECAUSE YOU ARE SUCH A NICE PERSON. Speaking of nice people, let's talk about Erin! Under "employers" on her Facebook profile she has listed "Domestic Goddess, Jewelry Designer, Taker of the World by Storm". BAM! As a former Massachusetts-ian, Erin is also a huge Red Sox fan. I mean, she has a special "favorite athletes" section on her facebook info page. Favorite athletes? Props to you, woman, for being all diverse and junk. My favorite athletes are...um...Justin Timberlake and Beyonce? For their mad booty shaking skills? That takes some physical prowess, doesn't it? According to the same informative profile, she speaks English, Spanglish, Drunk and Gibberish., Pig Latin, and Binary language of moisture vaporators. I mean, that makes her the multiest-lingual designer I've ever met, probably. And speaking of linguistics, she also refuses to associate with people who don't know the difference between "your" and "you're". So you can still buy stuff from her, but best not to show up for kickball until you've brushed up on your grammar, ya hear? In her free time, Erin likes to buy fabulous shoes, wear bold lipstick, and play beer pong with her sister who lives NEXT DOOR to her in Austin, TX (Tejas!). Are they the luckiest, or what? Somehow she also finds time to be an amazing mom on the PTA at her daughters' school and keep her house beautiful. Um, Erin...does your jewelry come with a free shot of Mojo? So take a gander at her Etsy shop, check out her blog, LIKE her fan page, and then leave me a comment. You could be the WINNER!!! *You do need to have a delivery address in the continental U.S. to play. The girl has to pay the bills, ya know? As usual, no one paid anyone to write this. I'm not getting free jewelry or a massage or anything. I just want my friends to be successful so when I go to parties at their houses, they won't serve me cheap wine. On it, bonnet - hope I win! Can I swear? Because I don't live in the US of A. Damn. Love the jewelry! I liked her. I love big chunky rings. I must admit the nail polish is a cool idea. Pick me, pick me!! She is so clever isn't she? Combining her two favorite obsessions (jewelry and nail polish) into one growing business. Smartness! Love, love, love the bracelets. No...necklaces ...no I want one of everything. Can you arrange that, Dweej? Can you? I "liked" her. I-yay iked-lay er-hey esterday-yay, and I-yay ordered-yay a-yay ing-ray. But I'm sure another would be fun. Now how to keep her from combining beer pong and PTA? Done and done! Cute stuff! Done done and done on the whole FB page thing. I would like to wear the ring before my daughters get to it. Dwija, you failed to mention that in addition to her sister I am also the director of sparkle! Although, I don't think she makes that too public...but business cards don't lie! Also, I love your blog!!! A giveaway! Woohoo! I totally liked the FB page...mostly to save you from being served cheap wine. I knew I liked you. @Julie- Director of Sparkle! If you send me a picture of that business card, I will slap it on this post lickety split! Bwahaha You make giveaways fun. "Cheap wine." 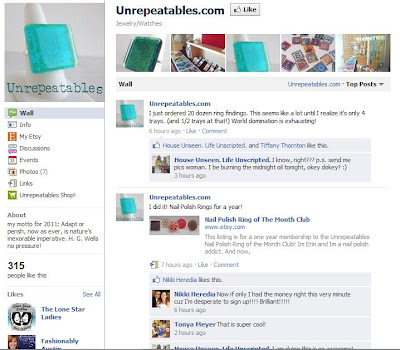 LOL And, um, yeah, I liked Unrepeatables on Facebook. Oh! I liked her, but I actually LOVE her rings. What a great giveaway! Thanks, Dweej! Love love love her creations!!!! I liked her on FB of course!! You know how awesome your birthday is on Facebook? That's how I feel right now. Thank you Dwija for the fabulous entry and to everyone for the sweet, sweet compliments! I heart this whole experience! These are awesome. I love the ring, I would have to work up confidence to wear it since I usually only wear big necklaces and earrings. Big rings make me feel like a rock star though, and there is nothing wrong with that! Love that necklace with the flower! Dwija, just want to let you know that I am in LOVE with your blog (not weird, girl-on-girl Love, just friendly, "your words seem to make my days a little brighter" kind of Love!! Thanks for adding a little sunshine to many of my otherwise dreary days!! Oh yeah, I "liked" Unrepeatables. Cute rings!! @TKV- weird, girl-on-girl Love. HAHA! Done and done, now GIMMEE THAT AWESOME SPARKLY STUFF! I believe my original comment was, "Double liked!" And now I will add, I have seriously been staring at those pretties and double liking them ever since you posted this! Love her rings!!! Rings make me happy!! I "liked" her FB page and now I'm crossing my ringless fingers for a win!!!! Damn blogger erasing my comment!! Aw, my comment disappeared! I "liked" her FB page and would love to win one of her fabulous rings! I'm glad you came back...blogger is the devil! I don't wear much jewelry, but these really caught my eye! Thanks! I liked her. But I don't wear rings, but maybe I would if they were free. I "like"ed the page and LOVE the jewelery!!! Dwija, just wanted to let you know I LOVE your blog. It really makes me smile every time I seem to need it the most. Thanks for being so open with all of us and for sharing all the "crazy" moments you experience. Oh yeah, I "liked" her page. Cute rings!!! The rings and other jewelry are wonderful! Hope I win! !1 I love your Blog, my daughter told me about it (Heather) and I have got you saved in my favorites!!! Liked the fbook page! I love these designs, they are playful and instantly raise the mood of both viewer and wearer. Too bad I don't live in the continental US. I like her stuff.You do know that postage to Alaska is the same as to the other 49 states' right? as we wait for the results of the Ring Giveaway I just want to thank Dwija and her amazing readers for your lovely compliments about my work. Every day of the last week has been like Christmas! If an artist tells you it's not about the response, they're lying to to you and you should pinch them, we love a good response! Otherwise we might have gone into something difficult and thankless like nursing or teaching! (I appreciate nurses and teachers! but if you are a nurse or a teacher then you know what I'm talking about!!) :) Thanks so much again!!! xo.